Leaving your laptop at home is supposedly going to help you relax, but what if you're more anxious without your laptop? You may not be working during the trip, but there could be possible emergencies to handle. And let's not forget that a laptop can function as a travel agent, a guidebook, and an entertainment center, too. It's not just thieves who pose a threat on your precious laptop. Mundane things that happen while you're rushing to the airport can harm it too. If you drop the laptop or squeeze it into a spot that's too tight, it can scratch and crack. Place your laptop in a cushioned laptop bag, preferably one that's plain and inconspicuous, so you don't attract unwanted attention. For extra protection, choose a laptop bag with features like slash-proof fabric and tamper-resistant zippers. If you travel a lot, consider buying a checkpoint-friendly laptop bag that will allow you to stroll through security without taking the laptop out of the bag. Keep the bag on your person or within view at all times. A cheap anti-theft device, a security cable lock works like a bicycle lock. You loop it around a fixed object, connect it to the laptop and lock it with a combination or a key. If you don't mind spending a little more money, you can buy a high-tech cable lock that comes with a motion sensor system and an alarm. When someone tries to remove the laptop, the movement will trigger the alarm, alerting you of the theft attempt. If possible, avoid shopping online or logging on to your online banking website on a public Wi-Fi network. If you really have to do it, always check that your Internet browser shows a URL beginning with "https" and a padlock icon. If you often use public Wi-Fi networks, consider spending some money on a Virtual Private Network (VPN). This service protects your Internet connection by encrypting all the data you send and receive online. Another perk of using a VPN while traveling is being able to access online content that's not available in certain geographic locations. Your chances of getting your stolen laptop back are a lot higher if you have a theft recovery software installed on your laptop. This software allows you to locate the laptop so you can have the local authorities retrieve it for you. A good theft recovery software works even if the thief has erased all data and installed a new operating system. Take down the specifications of your laptop before you travel. The laptop make, model, and serial number will come in handy if you have to report a theft. Also take photos of the laptop, focusing on any distinguishing details, such as scratches and dents. If you won't be using the sensitive files during the trip, consider deleting the copies on your laptop. 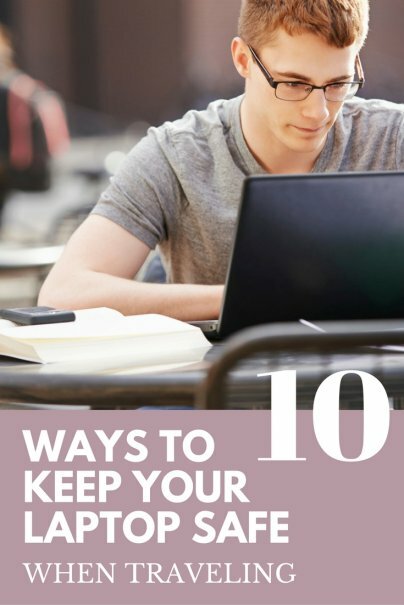 If you lose the laptop, you won't have to worry about those files and can use the back-up data to carry on where you left off. You probably have sensitive information stored on your laptop. Copies of your IDs, your home address, contact details of your associates, personal photos, banking details — all this information can be used for identify theft if it falls into the wrong hands. To minimize the risk of unauthorized access, you can encrypt your data and use strong passwords. Full-disk encryption protects all the data on your laptop, but it's a little overkill unless you regularly work with a lot of sensitive information. For most people, it's easier to pick and choose the files to encrypt. Many common programs and applications like Microsoft Word, Microsoft PowerPoint, Dropbox, and Evernote have options for you to encrypt specific files and set passwords for them. Use strong passwords with a good mix of uppercase letters, lowercase letters, numbers and symbols. If you find it hard to remember these passwords, use a password management software or write the passwords down on a piece of paper stored separately from the laptop. How do you keep your laptop safe while you travel. Please share in comments! All great suggestions! I've travel all over the world with my laptop and here are a few of the things I do to keep it safe. I use the Swiss Gear Computer backpack that is extremely durable and has a heavily padded laptop slot inside, which I think is less conspicuous than a laptop case and I always keep it padlocked. Depending on the hotel, I either leave it locked in the backpack and put it in a closet, put it inside the zippered lining of my suitcase under my clothes, or leave it at the hotel desk. I've never had a complaint about leaving it there, even if it's 3 times a day. Travel safe and travel often!